Hitachi unveiled the world's first Blu-ray camcorder last year and since then no other company has followed suit. So, it's up to Hitachi to trump its own wares. The company did this in January by releasing the DZ-BD9H, and now it has taken them just six months to come up with a new-and-improved model. The update to the DZ-BD9H, which in turn was an improvement on the first-generation DZ-BD7H, is unsurprisingly titled, the DZ-BD10H. Forgoing its precursor's black look, the BD10 has gone back to the original silver finish with a slimmer chassis and more pixel power. Recording is to 8cm Blu-ray discs, but there's also a 30GB hard drive included and a 7MP CMOS sensor. Other features include a 2.7-Inch LCD screen, HDMI output, a face detection function and a SD/SDHC slot. There's also a handy 10x optical zoom. 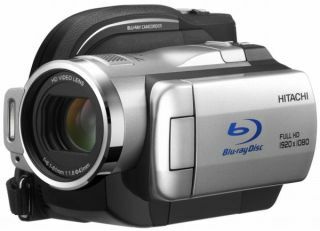 In HX mode, at Full HD resolution, the camcorder musters up a 15Mbps bitrate, and the hard drive can house 4.5 hours of footage. You'll have to keep a few spare batteries if you want to do that in one sitting though as battery power lasts around 80 miinutes. The cam's new diminutive frame measures just 3.1 x 5.5 x 3.4in. The camcorder is out in Japan in August for around 150,000 Yen (around £700). There's no word as of yet on a UK release.